Anti-whaling activists accused a Japanese harpoon ship of intentionally ramming and sinking their high-tech boat, the Ady Gil, during what has become an annual confrontation between whale hunters and activists in the southern seas. One crew member, a cameraman hired by Animal Planet for the reality TV show Whale Wars, sustained minor injuries in the incident, but Australia's Deputy Prime Minister, Julia Gillard, said after the incident occurred on Wednesday that it was "miraculous that lives were not lost." Each side blames the other. The Sea Shepherd Conservation Society, which owns the Ady Gil and other ships devoted to disrupting Japan's ongoing whaling efforts, said in a statement that the space-age speedboat was "dead in the water" when the Japanese ship, the Shonan Maru No. 2, rammed it. Peter Hammarstedt, the first officer of the Bob Barker, a sister ship of the Ady Gil named after the former Price Is Right host and donor, says that five of the six Ady Gil crew members were on deck waving to the Bob Barker when the whaling ship cut across the Ady Gil's bow, splitting it in two. "It was completely unprovoked," Hammarstedt, who watched the collision from about 200 m away, told TIME. The Shonan Maru No. 2 has a different story. Japan's Institute of Cetacean Research (ICR), which operates Japan's whaling fleet, claims that its vessels had been under "continuous attack" on Wednesday and that earlier in the day, the Ady Gil had fired butyric acid projectiles  more commonly referred to as stink bombs  onto the deck of the Nisshin Maru, another whaling ship in the vicinity. Furthermore, at the time of the collision, the ICR says, the Ady Gil was attempting to entangle the Shonan Maru's rudder with a large rope. The actions, says the ICR, are "nothing but felonious behavior." The Japanese Fishing Agency also released a statement saying that it is "extremely dangerous to threaten vessels and its crew" and that Sea Shepherd's actions are "absolutely unforgivable." Though an international moratorium on commercial whaling has been in place since 1986, Japanese whalers use a provision  some say a loophole  that allows whales to be killed for research. This summer in the southern hemisphere, Japan aims to cull 985 whales for scientific purposes, according to a Reuters report. Though their boats are emblazoned with the word "Research," much of their catch ends up on the plates of Japanese consumers, not in labs. Japan's ICR says that the income from whale-meat sales funds scientific research and that international law mandates that it not waste the meat. The collision is only the latest kerfuffle in years of bitter clashes between activists and whalers, but it underscores how the annual whaling-activist conflict has escalated as both sides acquire new technology. The Ady Gil, a carbon-fiber ship worth about $1.5 million, has an uncanny resemblance to the Batmobile and holds the world record for circumnavigating the globe in only 61 days. 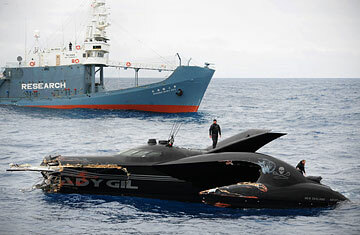 Sea Shepherd was able to purchase the celebrated speedboat, previously called the Earthrace, after Hollywood businessman Ady Gil donated $1 million. Japan accuses its activist crew of shooting dangerous, high-powered lasers at its crews. Sea Shepherd, on the other hand, says the crew has been shot at with sonic guns and water cannon. Paul Watson, founder of Sea Shepherd, even claims the ICR's public relations firm hired a spy plane to follow its ships. For more than three decades, the Sea Shepherd Conservation Society has rammed, sabotaged and shot stink bombs at whalers and commercial fishermen. Watson founded Sea Shepherd's forerunner Earth Force Society in 1977, and since then, he and his organization have not shied away from controversy. He has attacked Greenpeace, an organization he also helped found, calling the group "the Avon Ladies of the environmental movement" because of their allegedly wimpy tactics. Over the years, Watson has come under firearms attack four times, according to his website. In a 2008 Whale Wars episode that some critics have said was faked, Watson is apparently shot in the chest by whalers; viewers watch an assistant remove the remains of a bullet from Watson's Kevlar vest. After Sea Shepherd purchased a small submarine in 1994, the Canadian navy said it would be too dangerous for a civilian to operate. Watson's reply to Canada: "Since World War II, the Sea Shepherd Conservation Society has boarded more ships, rammed more ships, engaged in more high-seas confrontations and sunk more ships than the Canadian navy." It remains to be determined who is really at fault in this week's incident, but one thing is sure: the so-called whale war is not over. Watson's bluster and aggressive tactics may have earned Sea Shepherd a reality television show (and a parody on South Park), but its high-profile approach has also helped the organization get charitable donations from major Hollywood players. Though Japan's ICR claims that almost half of the International Whaling Commission's members support sustainable whaling, right now only Japan, Norway and Iceland hunt whales in significant numbers. Even with the loss of its fastest vessel, Sea Shepherd has the ships, funds and, most important, the will to continue. As Watson told reporters on Jan. 6, "We have a real whale war on our hands now, and we have no intention of retreating."